Awoke early to an almost clear sky and fresh morning air. A beautiful morning. If you don't feel alive today, you never will. The photo above is taken from the road heading from Kathu over to Patong, looking back over Kathu towards "Monkey Hill" (Khao To Sae). 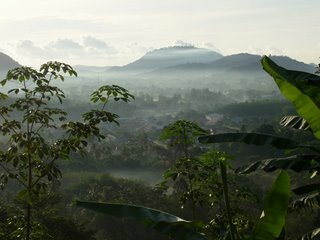 On a sunny, crisp morning the mists hang over the land like a baby's blanket. 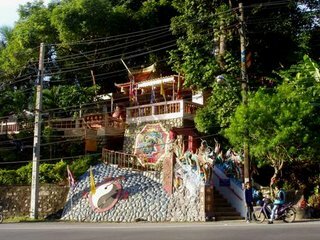 At the top of this hill, as you start the descent into Patong you find a Chinese shrine, which was also bathed in early morning light today.